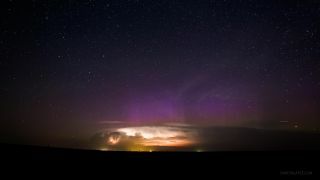 This image is a still showing an aurora behind a building thunderstorm from the time-lapse film "Huelux,” shot from April to November 2013, in South Dakota, Wyoming and Utah by astrophotographer Randy Halverson. Auroras dance, the Milky Way dazzles and lightning sparks in the night sky over South Dakota, Wyoming and Utah in a magnificent new time-lapse film. The video, called "Huelux," was captured from April to November 2013, by astrophotographer Randy Halverson. Slow and fast moving satellites can be seen in shots of the Milky Way , and some meteors and airplanes can also be spotted in the video. The meteors appear as quick flashes because they only last one frame. "If you see a light moving across the sky, it is either an airplane or satellite, not a meteor," Halverson wrote on his website. "In one case an hour before I got any aurora notification on my phone," He said. "The storm shot at 2:57, has aurora behind it, which was quickly covered up by the storm." The end credit background images are 10-second, time-lapse exposures of Andromeda Galaxy and Orion taken with a 200 mm lens on an Ioptron Skytracker. Halverson used two Canon 5D Mark III cameras and a Canon 6D camera along with the following lenses to capture the images seen in the video: Nikon 14-24 with Novoflex adapter, Rokinon 25 and 35, Canon 16-35, Zeiss 21, Sigma 15mm Fisheye, Canon 200mm, and a Canon 70-300.